Microsoft is testing Eye Control in the Windows 10,which will enables the control of mouse ,keyboard and text-to-speech features with eyes. Microsoft tests Eye Control in windows 10,Microsoft is testing Eye control in the windows 10 updated version,Now you can control mouse,keyboard with your eyes in windows 10,Windows 10 has now Eye control in it,Eye tracking hardware by tobbi required to enable Eye Control "
the feature that allows people to control the features of the operating system with their eyes. 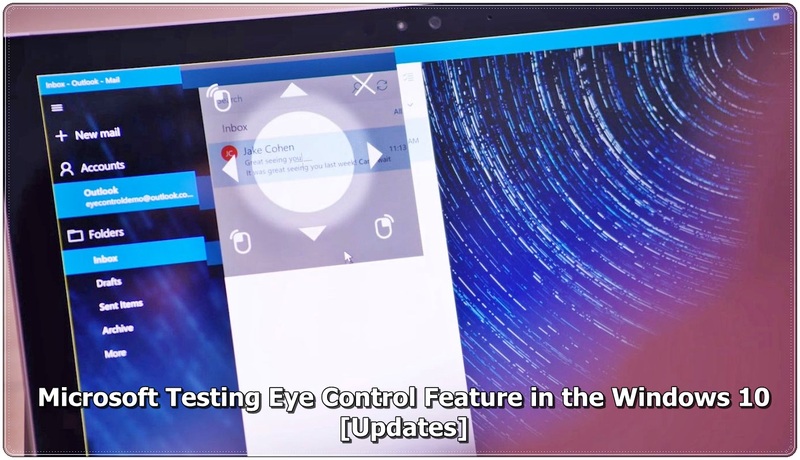 Microsoft is now testing the Eye Control option in the windows 10 as a built in function. From the last few months Microsoft has speed up their work for window 10 updates and also the introduction like Window 10 plus it is looking that they are now in the loop of innovations which is likely the demand of the market. Now they are coming with an Eye Control option in which a user can control the Mouse, Keyboard with the gestures of his eyes. Eye Control is aimed at “empowering people with disabilities to operate an on-screen mouse, keyboard, and text-to-speech experience using only their eyes,” Microsoft said in a blog post on Wednesday. Users require eye tracking hardware by Tobii in order to try out the feature. When Eye Control has launched a box appears allowing a user to choose to control the mouse, keyboard or text-to-speech feature with their eyes. When the mouse function is selected, a user has to look at what they want to click on then select, again with their eyes, what action they want to take such as a left click or right click. Typing works in a similar way. Users need to look at letters that they want to type. But Microsoft is also trialing a feature called “shape-writing” to help people type faster with their eyes. This feature is currently in the beta testing stage for the so-called Windows 10 Insider Preview Build, which is available for select users. Now If you have selected the Mouse feature means you want to control a mouse with your eyes, you just need to look on what you want to click then again look at the same thing for further right or left click. Similarly, by looking at the word on the keyboard, you can write your respected word or sentences. Another technology on which Microsoft has worked and is available for the selective users is the auto-generation of the world like you just dwell the first and last letter of the word and then just look at the remaining letters it will give you your needed word. They also give you the option to swap the world if that is not your related word. Microsoft is now killing the show as they are coming with some real things that are the most wanted in the market like they have some other features to launch in the Window 10. Microsoft is working on the better appearance of the windows and they are going to improve the color schemes for the users so that they enjoy using Windows 10.